Dorothy gets a bit nervous and almost chickens out, but she pulls herself together. She speaks to a lady at the dating agency. Dorothy has come to the agency on behalf of "a friend". Dorothy explains that her friend is looking for a social companion, not romance, particularly. The lady explains that they treat their clients with the utmost discretion. She explains that for $500 Dorothy's friend will receive unlimited introductions over a 12 month period, and all the clients are carefully screened. The lady says that Dorothy needs to make a video - it's a more honest approach that a resume or photo. AGENT: Why don't we put something down on tape right now? 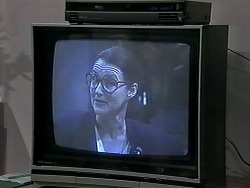 AGENT: Mrs Burke. We get lots of friend in here. DOROTHY: (laughs shyly) I see. Harold is showing Helen photos of Kerry. He keeps saying how precious memories are. He goes off to get more photos from Joe's house, ready for the TV people. 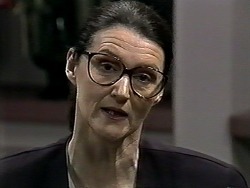 When Harold has gone, Madge tells Helen that she's really concerned about Harold. Helen says it's been a terrible shock to everyone. Madge says that Harold won't let go and is keeping all the newspaper clippings. She thinks Harold's grief is unhealthy. He won't go back to work yet either. Helen says that Harold will come around - they just have to hang in there. 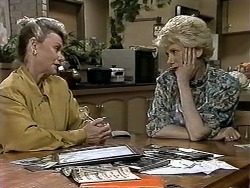 Helen tells Madge that Paul and Isabella are coming to lunch. Paul and Des are telling Eddie that he must tell the police that Joe was his source or he'll be deported. He isn't keen, repeating that Joe will get into strife, but Des and Paul reckon the police will pursue the real criminal (Joe's mate). Isabella is cooking again and is waiting on Paul hand and foot. Paul says that South American girls treat a man as he should be treated. 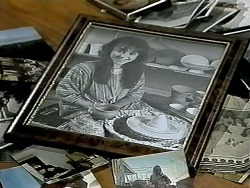 The camera shoots to the kitchen where Isabella has an odd look on her face. Dorothy is about to make her video. She is very nervous and speaks rather severely into the camera. She lists her requirements and it sounds rather like a job interview! Then she talks about herself and she seems very cold and stern. The introduction lady rolls her eyes! AGENT: Do you need the glasses? DOROTHY: Only if I want to see. The agent tells Dorothy to speak from the heart - the gentleman who sees the video should see the real her: the nicer side of her nature. Harold and Sky come in with a load of wedding photos. He starts reminiscing about Kerry again. Eddit comes in and invites Harold to come on a bike ride with him, but he firmly refuses. He looks feverishly through the photo albums instead. 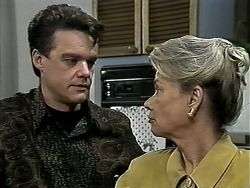 Madge asks Harold if he's planning to go back to work - it's not fair on Eddie. Harold reluctantly agrees to go in for a few hours tomorrow. The agent and Dorothy are watching her video back. It's better this time - the agent is happy, but Dorothy isn't so chuffed. She thinks she should have said more about her travels - she wants to do it again. The agent protests, but Dorothy insists. 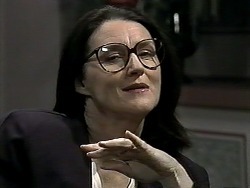 Helen tells Paul that Isabella is lovely, but she's very different to the women Paul is normally attracted to. Also, they are miles apart culturally. Paul says he's sick to death of high-powered business men. Helen says that Paul is being a bit exploitative but caves in in the end. She tells Paul not to keep Isabella as a servant - and in a few weeks she'll have to go home - what will Paul do then? 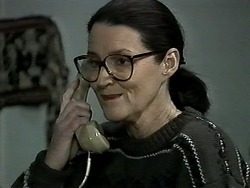 Madge is hiding a newspaper article from Harold. 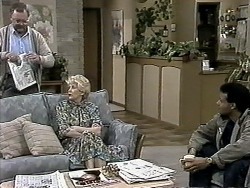 Eddie comes in and Madge says that Harold will come into work tomorrow. Harold comes out looking for a newspaper. It's the one Madge has hidden. He reads the article and obsesses about it. Dorothy has undone her hair and is making a very relaxed video all about her travels. Isabella is waiting on Paul again. He sits her down to have a talk to her. He asks how she likes her situation in Australia - especially the cooking and cleaning. She says that as long as Paul is happy, she is happy too. Paul says that he doesn't want her to go home. She says she loves her family, but she doesn't want to leave Paul either. Harold has come in to work at last. Sky is in the day care centre. 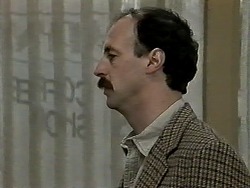 Des comes in and is surprised to see Harold there. He orders some breakfast. Just then a man comes in looking for Harold. It's the man who shot Kerry. 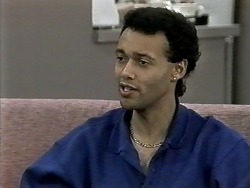 MAN WHO SHOT KERRY: Mr Bishop, I know how you must feel. It was an accident. I've been over it a thousand times. HAROLD: You get out of here! Go on! You get out! MAN WHO SHOT KERRY: I'm so sorry. 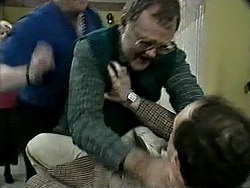 Harold loses control and tries to strangle the man, calling him a murderer. Des drags him off as Harold sobs his heart out.